BERLIN, Sep 9 2015 (IPS) - Finance ministers and central bank governors of the world’s 20 major economies, accounting for 66 percent of world population, have pledged to “promote an enabling global economic environment for developing countries as they pursue their sustainable development agendas”. In this context, they are looking forward to “a successful outcome” of the U.N. Summit in New York for the adoption of the 2030 Agenda for Sustainable Development. The summit will be held from Sep. 25 to 27 in New York as a high-level plenary meeting of the General Assembly of the world body. The G20, meeting in Turkey’s capital Ankara on Sep. 4-5, reviewed ongoing economic developments, their respective growth prospects, and recent volatility in financial markets and its underlying economic conditions. They welcomed “the strengthening economic activity in some economies” but said that global growth was falling short of their expectations. To remedy the situation, they vowed to take decisive action to keep the economic recovery on track and expressed confidence that the global economic recovery would gain speed. With this in view, they would continue to monitor developments, assess spillovers and address emerging risks as needed to foster confidence and financial stability. 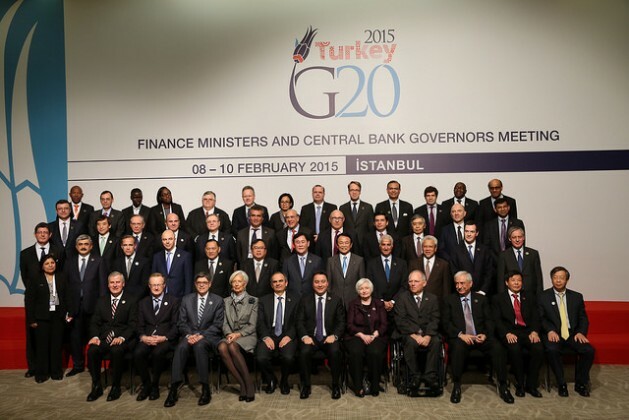 The G20 welcomed “the positive outcomes of the Addis Ababa Conference on Financing for Development (FFD)”. In support of these, they aim to scale up their technical assistance efforts to help developing countries build necessary institutional capacity, particularly in the areas specified in the Addis Ababa Action Agenda. The agreement was reached by the 193 U.N. Member States attending the Conference, following negotiations under the leadership of Ethiopian Foreign Minister Tedros Adhanom Ghebreyesus. The G20 includes 19 individual countries – Argentina, Australia, Brazil, Canada, China, France, Germany, India, Indonesia, Italy, Japan, South Korea, Mexico, Russia, Saudi Arabia, South Africa, Turkey, the United Kingdom and the United States – along with the European Union (EU). The EU is represented by the European Commission and by the European Central Bank. The Group was founded in 1999 with the aim of studying, reviewing, and promoting high-level discussion of policy issues pertaining to the promotion of international financial stability. It seeks to address issues that go beyond the responsibilities of any one organisation. Collectively, the G20 economies account for around 85 percent of the gross world product (GWP), 80 percent of world trade (or, if excluding EU intra-trade, 75 percent), and two-thirds of the world population. The G20 heads of government or heads of state have periodically conferred at summits since their initial meeting in 2008. The G20 are responsible for 84 percent fossil fuel emissions worldwide. To support the climate change agenda of 2015, they welcomed the Climate Finance Study Group (CFSG) report, took note of the inventory on climate funds developed by the OECD (Organisation for Economic Cooperation and Development), and the toolkit developed by the OECD and the GEF (Global Environment Facility) to enhance access to adaptation finance by the low income and developing countries, especially those that are particularly vulnerable to the adverse effects of climate change. While recognising developed countries’ ongoing efforts, they called on them to continue to scale up climate finance in line with their commitments. “We are working together to reach a positive and balanced outcome at the 21st Conference of Parties of the UNFCCC (COP 21). Based on the outcomes and towards the objectives of the COP21, CFSG will continue its work in 2016 by following the principles, provisions and objectives of the UNFCCC,” they added. UNFCC is the United Nations Framework Convention on Climate Change that emerged from the Earth Summit in June 1992 in Rio, Brazil, which is currently the only international climate policy treaty with broad legitimacy, due in part to its virtually universal membership. The CFSG was established by Finance Ministers, in April 2012, and was welcomed by leaders in the Los Cabos Summit, in Jun 2012, with a view “to consider ways to effectively mobilize resources taking into account the objectives, provisions and principles of the UNFCCC”. In November 2012, Finance Ministers agreed to “continue working towards building a better understanding of the underlying issues among G20 members taking into account the objectives, provisions and principles of the UNFCCC”, and also recognised that the “UNFCCC is the forum for climate change negotiations and decision making at the international level”. Following the mandate of the group, and building on the CFSG 2013 Report, the Group identified four areas to be studied in 2014, namely: (a) Financing for adaptation; (b) Alternative sources and approaches to enhance climate finance and its effectiveness; (c) Enabling environments, in developing and developed countries, to facilitate the mobilization and effective deployment of climate finance; (d) Examining the role of relevant financial institutions and MDBs in mobilizing climate finance. This report aims to present to the G20 Finance Ministers and Leaders a range of non-exhaustive policy options (“toolbox”) for voluntary consideration, related to these four areas, and to suggest further work on other important issues on climate finance. The G20 said they were “deeply disappointed” with the continued delay in progressing the 2010 International Monetary Fund (IMF) Quota and Governance Reforms. In their view, their earliest implementation is essential for the credibility, legitimacy and effectiveness of the Fund and “remains our highest priority”. As part of continuing efforts to promote market confidence and business integrity, G20 Finance Ministers also endorsed a new set of G20/OECD corporate governance principles. Sound corporate governance is seen as an essential element for promoting capital-market based financing and unlocking investment, which are keys to boosting long-term economic growth. “In today’s global and highly interconnected world of business and finance, creating trust is something that we need to do together,” OECD Secretary-General Angel Gurría said during a presentation of the new Principles with Turkish Deputy Prime Minister Cevdet Yilmaz,‎ who chaired the G20 finance ministers meeting.